Pugilistic Dementia; Something old, something new? Few writers met the news of Oscar DeLaHoya intention to continue fighting with the type of disappointment expressed by Bill Dwyre at the LA Times. Is every other writer too entrenched in the hushed, unspoken agreement to keep boxing relevant, to comment objectively? Is Bill the sole voice of reason? Recycling the last remaining superstars of the 1990’s is a tired but reliable format after all. Perhaps we’re all guilty of overlooking the risk DeLaHoya is taking – hypnotised by his eloquence and undiminished good looks? More likely, Dwyre is exaggerating the symmetry between DeLaHoya and the likes of Mike Quarry, Ali and Evander Holyfield, to whom he refers. Thought provoking either way. Nobody of sane mind, could propose boxing is a sport without risk, nor could anyone suggest that the ageing process and the associated loss of reflex doesn’t make older fighters more vulnerable to heavy shots. Using the exemplar of Mike Quarry, a courageous fighter reduced to a child like state for two decades by the punishment he received in the ring, is bound to emote but is it truly representative of the effects of fighting on too long? Surely, it is in that comparison that the greatest flaw in Dwyre’s logic emerges, a comparison of the two beyond their longevity and profession generates few similarities. Oscar may have combative Mexican blood running through his veins, and he’s been a fearless fighter in the ring too, but his renown offered him latitude in the selection of opponents that has protected him from the full wrath of several heavy punching contemporaries. Plus the fact, he’s a damn fine fighter too. Dementia of any type is a cruel and relentless condition for anybody, stripping the dignity and personality of everyone it encounters. But somehow the effect on a professional fighter, fearless and physically capable, seems even more acute. Dwyre is right to highlight the increased risk fighters who continue to punch for pay into their middle age take. Boxing is arguably supporting more fighters as elite contenders than ever before, the Light-Heavyweight division alone is led by Clinton Woods, Roy Jones Jnr, Bernard Hopkins, Antonio Tarver and Glen Johnson. In no preceding generation would so many veterans still be heading the pack. Is boxing failure to unearth new, exciting, dynamic fighters to oust these relics placing them and boxing’s future at risk? A catalogue of profile fighters with demonstrable pugilistic dementia would surely be close to a death knell for the sport. 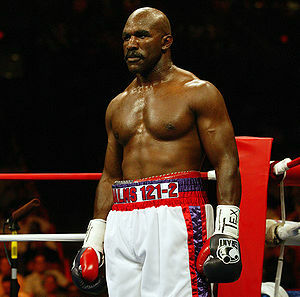 Holyfield - a high-profile risk to himself, and to boxing? The networks are too eager to sustain these veterans, apparently reluctant to wholeheartedly support their potential successors, building their profile and following. Due in part by an over-reliance on pay-per-view revenue to generate the purses fighters seem able to demand. How do you sell PPV with fighters unknown to the public? Instead, they prefer to showcase the well-known fighters of the preceding era. Hence Vargas v Mayorga, Jones v Trinidad, Wright v Hopkins rather than Taylor v Calzaghe or Dawson v any of the old guard. Perhaps this reflects, and further perpetuates the ageing demographic of the average boxing fan? Certainly, something is holding the next generation of stars back; is it simply the networks giving the ageing fan base live action boxing memorabilia? Frustrating is the ease with which new fighters can be built into marketable commodities as demonstrated by the Contender concept, a series that plucked a collection of nearly men from the shadows, turned on a camera and made millionaires of half a dozen of them. Mora, Manfredo and Gomez, not a superstar talent in sight, all earned high-profile bouts on the basis of their appearance on the show first, their ability second. Is it so hard to find and have faith in new contenders? At the National Association of Black Journalist convention recently a forum discussed the health and future of boxing, variously contributed to by Floyd Mayweather, Bob Arum, Don King and Tim Smith. One commentary suggested this lack of investment in publicising and exposing future fighters to a television audience reached as far back as the Olympics. A traditional breeding ground and showcase for the next generation of household names, the event is no longer even covered by the major networks. In other words, boxing keeps the oldies in the chain gang long beyond their primes because there is insufficient talent joining at the other end and yet does little to unearth, attract or support new, aspiring fighters. Where does it end? For Bill Dwyre, he suggests it ends with several leading fighters suffering in the way Ali and Quarry already do. Boxing never was any good at learning from its mistakes. 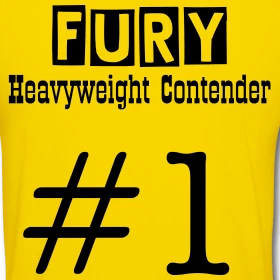 For a host of unique, unofficial and unendorsed tribute wear, made to order and shipped within 48 hours visit, www.boxingwriter.spreadshirt.net or click on the image. I have read that the drinker most likely to get liver disease is the one who can “drink you under the table”. The same holds true for the punch-drunk. Three Quarry brothers succumbed to Dementia Pugilistica. Years later I remember watching a film of Jerry Quarry take Joe Frazier’s hardest left hook without falling. He was staggered, but he remained upright to take even more. Foreman was hit a lot, but seems to be fine. Foreman did however take many years off from boxing which makes comparing his age to Holyfield’s dubious. To echo another poster, the defensive skills of Ray Robinson or Benitez prove that good defense alone is not enough. Rather than a mandatory retirement age, there should be mental acuity tests a fighter must take periodically throughout their career. This could weed out the Meldrick Taylors early. Wilfred Benitez, a fellow lovingly remebered as ‘the radar’ because of his superb defensive skill and ability to avoid punches, now suffers from boxing dementia. I’m sure the irony is not lost on those who remeber him. Whereas folks like Gatti, assuming he decides to remain retired, come away with relatively little lasting damage. Its like the triathlete who drops dead of a heart attack at 22 and the heavy smoker who lives to see 83. Must be an element of genetic predisposition, in terms of skull density and whatnot. Terrible shame, but then they know the risks. Is his ‘wanderin’ eye’ anything to do with too many blows to the optic foramen? In all seriousness, the only way out is universal and rigerous medical testing. While the likes of Joe Mesi and Holyfield can box in a whole bunch of tank states after being disqualified from Nevada, New York and New Jersey, there will always be cases like this. There’s no avoiding that boxing, in its very nature involves serious risk of brain injury. However, with properly funded, universal — US Federal, at least — medical testing and regulations, life for boxers could be much improved. Holyfield has made a lot of money in his career that true, but he keeps having to give half of it away every 3 years or so due his “wanderin’ eye”.. Yes, there’s no way a mandatory retirement age of maximum number of bouts can be fairly enforced. Foreman held the title until he was 48, while Tyson’s best work was behind him at 23. And one Gatti or Corrales fight is probably as draining as five Nelson or Mayweather fights. Supply and demand is the only way to protect fighters. If you dont watch, they dont fight. Archie Moore and Bernard Hopkins are both examples of why enforced retirement is unfair. These are valid points. As for the number of fights allowed, I realized there have been people who fought over a hundred fights in the past, but just because it’s been done and someone survived doesn’t mean we should allow it in the future. Many have done it and been permanantly damaged. I will say that lighter weights may be allowed more fights than the big guys, as the greater the power of the punch the more the damage. It’s a matter of discussion and scientific evidence. As for George Foreman, I didn’t consider him. He had a long layoff in the middle of his career and maybe the clock should stop ticking if you’re retired and only be started again when and if you come back. I don’t pretend to have the final rules predetermined; but I do believe there should be rules to protect fighters from themselves and their natural instinct to never quit. Whilst your point is arguably a good one, what of fighters like Matlala or Foreman? These guys were competing with very good fighters, and winning, right into their mid to late forties. Can you deprive a fighter such as Foreman the opportunity? Especially if his performances merit the chance? At what age would this limit kick in, do you feel? Maximum number of fights would also be a problem. Someone like Julio Cesar Chavez JNR would be reitired before his career even kicks into second gear! There should be a mandatory retirement age and a maximum number of fights a boxer is allowed. I know this may sound controversial but look at Ali. Look at Jerry Quarry. Look at so many of them. They don’t know when to quit. I think Larry Holmes is still fighting. Roberto Duran fought into his 50’s. Fighting requires a license just like driving does. They should be taken away eventually, just the way driving licenses are. Excellent article and a very good theory in your comment, Dave. What is more curious about DLH and Holyfield, as opposed to less remunerated fighters like Mike Quarry, is that they’ve achieved great wealth in their careers. It really is all about the thrill of the crowd, and the cliched, Rockyesque battle with themselves rather than the opponent. Personally, I think DLH’s continued career is merely part of a bigger strategy to keep GBP in the forfront of people’s minds, allowing him time to attract and accumulate a large stable, bank rolled by his annual outings. I agree with Dwyre in that DLH seems to be making a mistake in carrying on. Jack Dempsey once said that a fighter is only ever fighting for money. All this talk about a legacy is crap. Just look at the likes of Jerry Quarry or Sugar Ray Robinson who both carried on too long. I once read somewhere that the rate of pugilistica dementia for fighters who had more than 20 fights was 80%. But it seems that no one talks about this in boxing until it’s too late. There’s also a hypocrisy in boxing where the media will start advising a fighter to retire before he damages himself. What gets me is that brain damage is an accumulation of fights, not from one or two. Any fighter who starts slurring in the ring is doing so as a result of ALL the fights he’s had, not the one or two most recent.